Here are the lastest issues of The Sheet - new editions! The 2017 sailing season is right around the corner and we are getting into gear with preparations. The calendar is updated online and the yearly budget is approved; and in case you missed the other emails our treasurer has sent out, the time for yearly dues is now. I’m glad to say we are financially sound for our current fixed obligations but having said that, not having the membership pay before May can put a damper on some of our projects going into the spring work party. Two of the approved Class B projects need funding in the springtime to make a significant difference, they are listed below. So I am respectfully requesting if you have the ability to pay your dues and you haven't yet, please do so soon. You can follow the link to our website's membership form by clicking here or at the bottom of the page, or contact our treasurer Teri Stanbro for more ways. If you wish to make an extra donation to a certain project you see below, please click on the button link under the photo and follow it to the project's GoFundMe page. With the calendar updated and published, there are a few key things to announce. The Spring Work Party was scheduled for the 13th of May. Due to the ice not letting out as early this year it is now scheduled for the 20th of May. Several members are still planning on being out there this weekend to work around the grounds due to their fixed schedules; but please understand we still need ample bodies at the actual work party for putting out the docks and boats. Please use the RSVP at the bottom of this email if you know what your are planning. 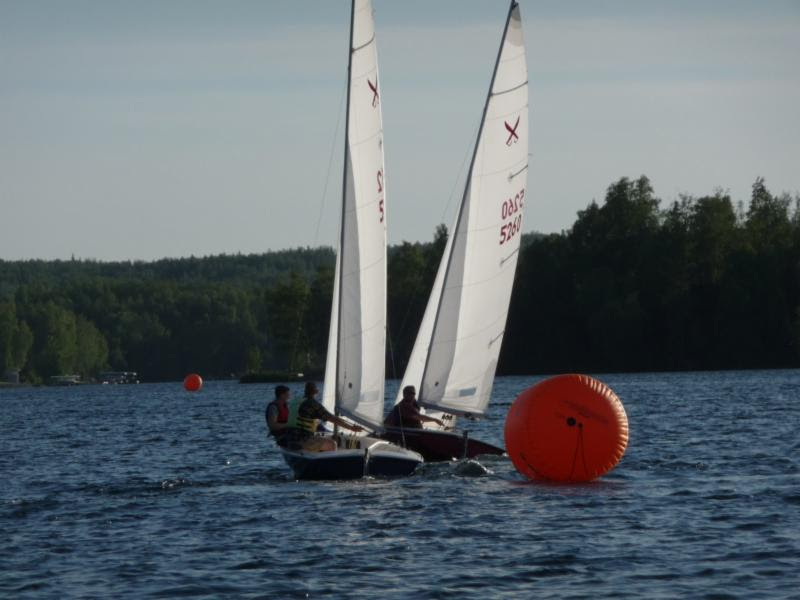 The Dinghy Class is scheduled for 4 days in June, the 22nd to 25th. The class was expanded to include the Thursday this year to allow the students to get more general hands-on time and more time between the various boats. If you plan on taking the class and haven't signed up yet please contact the Education Commodore by clicking here. Also that weekend is the Open House on Saturday, June 24th. The Stanbro's host the event as well as assist the class. Last year there seemed to be quite a few people who showed up. TL had a couple of boat loads of guests out for a sail on the Jezebel. If you would like to help Teri and TL meet and greet people, run the grill, or take people out on the Ensign, please contact the Stanbro's and let them know. 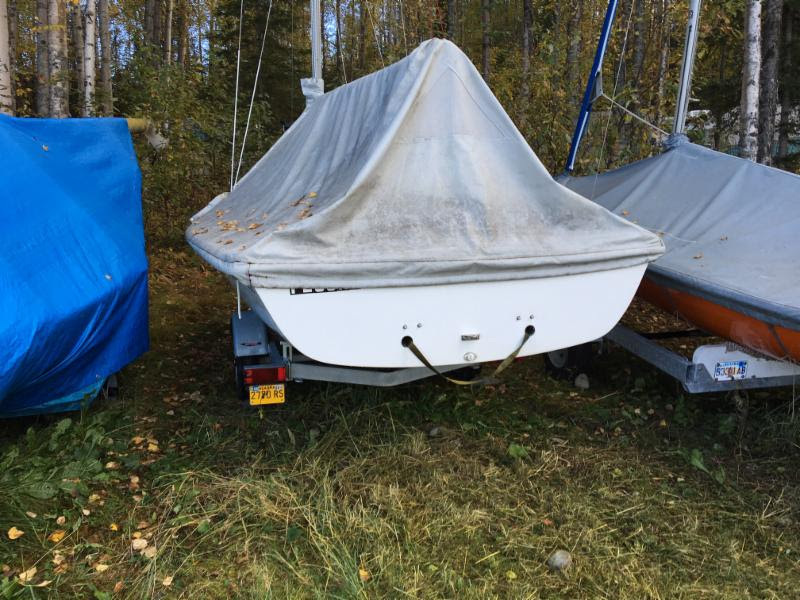 This year marks the 50th anniversary of the Alaska Sailing Club's home on Big Lake. There is some confusion as to the exact date. The Gov Cup actually has a few years on the club and was raced before the club had land to call home; but never the less we are celebrating the 50th this year during the July 4th race weekend. On Saturday July 1st at the end of the first day of the Firecracker Regatta, we are having a catered event with a band. Followed by Family Fun Day on Sunday July 2nd and more racing. My thanks to the Boards of the past for the planning of this; we have been saving for this for a few years now and I hope you can all make it out to enjoy the activities. A RSVP will be sent out closer to the date. For more info on our history please click here to check out our library. The snow is all gone but not the ice. As of Saturday the ice near the docks was still thick enough to stand on but that could have changed by the time you read this. The entrance of the club site and the upper road area are drive-able, but the drive down to the hoist and the back of trailer row are on the muddy side. Also be careful where you park; the grass behind the club house may not be appropriate for bald tires like mine. Big thanks to TL for taking the lead on the sauna stove replacement. We had a project left over from Jeremy Reed for replacing the roof, but during the budget review we decided that the level of building repairs needed to be re-scoped and we had a more pressing issue of a rusted out stove that needed immediate attention for safety. The new stove is allot smaller than the former 55 gallon drum with the steam rocks hopper welded on top, but for now it will do the job. 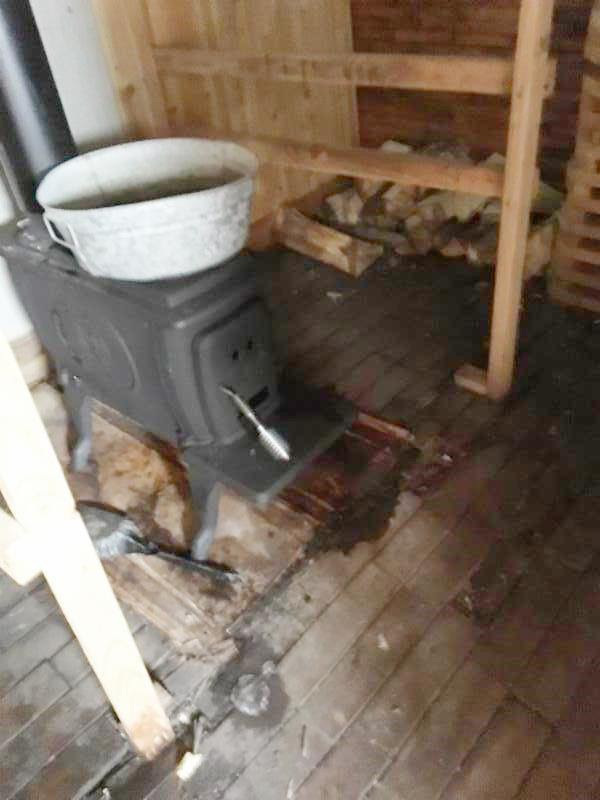 An old cast iron dutch oven may be the perfect donation to re-equip the sauna with steam rocks. We did the hard part and now it’s time to not push dirt around. 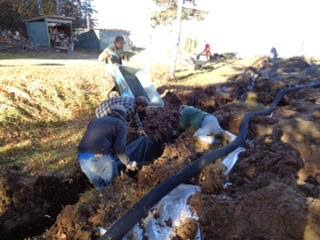 The Board decided that the remaining work for the French Drain repairs is better suited for a landscaper, so we have allotted funds in this year’s budget to get it done and save our backs. The plan is to moderately fill the sag area over the new French Drain, add a layer of topsoil, and hydro seed a new lawn. With this project, this should be the final year of the bog that we all won’t miss. Bids are being made and we should know what to expect in the next week. Local area roadway load restrictions will be the limiting factor as to how soon this project gets done. Last years French Drain Replacement project. Last year I started a task on my own just as a member, to see what it would take for the club to get new 2-person dinghies. The goal was to leverage our status as a 501(c)(3) and raise enough money to buy 3-6 new boats over a year to three year period. I researched numerous classes, manufacturers, and shipping options; the Lido 14 was the best fit for our club needs and logistical limits. After consulting the board I had a green light to try to make this work. I negotiated a price reduction from the manufacture, which would be in the form of an 'in store' donation of $5800, got firm quotes for shippers and competitively lowered the price with one of the companies. The total project cost was estimated at $38,000, this included boat purchase, shipping, repair and modification of current trailers, and other incidentals. With supporting grants of $25,000 and the in store donation of $5,800, the club would have had to fill a $7,200 doughnut hole for 3 well equipped brand new Lido 14's to be delivered; of which $3,000 would be contingent funds held until the completion of the project and later released back to the club's general budget if unused. 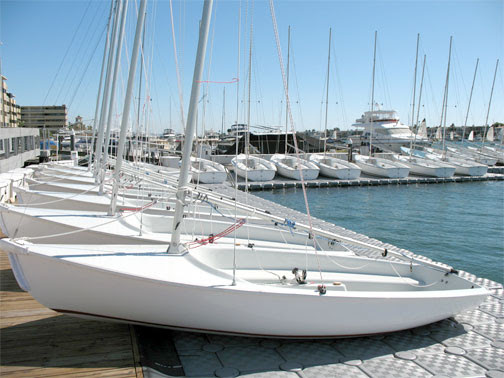 So 3 brand new boats potentially costing the club as little as $4,200. Unfortunately Alaska's economy has changed and the funding sources I was engaging have changed their policies as well. The resulting fiscal doughnut we would have to cover grew to over $19000. So sadly at this time we have to put off the purchase of new club boats for awhile until fundraising can fill the gap. On a better note the manufacturer may be willing to work with us in the future in the same manner. Interested to know what your board is working on? Below is a link to the latest approved minutes and treasurer's report. You can also attend the meetings. Just one of the many from our Blog. 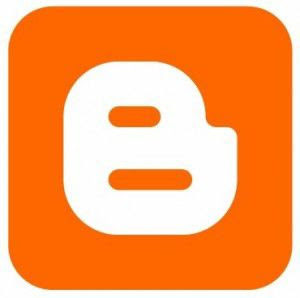 Click HERE to submit a pic of the club. Sometimes new is scary and sometimes it's just too new for comfort. But I hope this email is neither for all of you. This email was developed by using Constant Contact, a web mailing service that Terranova used a few times last year. I signed up for a free trial to see what it's all about and I must say I like it, but I know not everyone will. I wanted to try a few new things out, like the project 'pass the hat' list below and starting an easy monthly or just quarterly mailer. But the purpose of this wasn't for making a slick news letter to burden someone else with writing in the future, but rather to fill some gaps in our communication tool box. From looking around I thought this service was a good fit. There is a whole lot of plus side for using it that I don't have the time to get into, but there is a negative; all the neat tools and support come on the paid subscription version. The Board felt that this was not the right time for the added cost and advised looking into some of the free alternatives. So in the next few months you may see this come across your digital desk in a different (and not so wordy) form, please send me your comments as you see fit. On that note, in an effort to save my sanity with email I arranged for an official email for the commodore position. It will allow for future Commodores' to be informed of past correspondence and my shared family email to not get flooded. So if you want to discuss functional club items with the commodore please use the link below, if you just want to be social and talk club stuff with everyone the Google Group email is still fine as well as Face Book, and if you want to just laugh at me and tell me how bad I was in the last race, that will cost you a beer and your time at the fire pit. Lastly, if you weren't expecting to see an email from the Alaska Sailing Club in your inbox, you have my appolgies. One other downside to Constant Contact and more actually to how we operate with email and Google Groups, is that to get a mailing list installed I was going to have to copy and paste every first name, last name, and email address one by one. So instead of doing that for 3 hours I wrote a script to use in excel. The short end of it is that if you don't want this email ever again you can use the unsubscribe link at the very bottom of this page and if there are any mistakes to the names please let me know. I had this idea as a way to help projects keep momentum. It seems like often times a project will be needed but no one has interests in running it or funding might not completely be there. I thought if we had a way to connect people with projects, some of those projects that slide by the wayside would be picked up and carried. The other thought is that maybe the mailing list might grow to include people outside the club but still interested in helping out. Either way, having a quick way to donate directly to a project might help us move things forward. The 2 projects below are funded by the budget this year as Class B projects. They're being used here as an example set for this Pass The Hat section. BUT... they both have room for help. The buccaneer for instance is funded only to get the boat reassembled and sailing. It would be nice to have a boat cover, or mast float, or change the rig to the high boom style; all things that would be nice but are not funded. I used GoFundMe in this case as an experiment and as a work around with Constant Contact. Other mailer services have other capabilities. Maybe in the future we can use something like this to keep track and promote the bigger pipe dream projects and with a little more work this could even live on our own website; without the competition from other charities on GoFundMe. Yes we have one. No really, the club owns a Bucc 18 and it is currently at Bruce Lee’s auto shop amid a sea of Volkswagens, BMW’s, and other broken dreams. It has been there for over a year waiting for someone to take up the fiberglass repair and reassemble it. Bruce has been a little busy with club projects over the last few years and we need club boats, so we are going to help this project along. 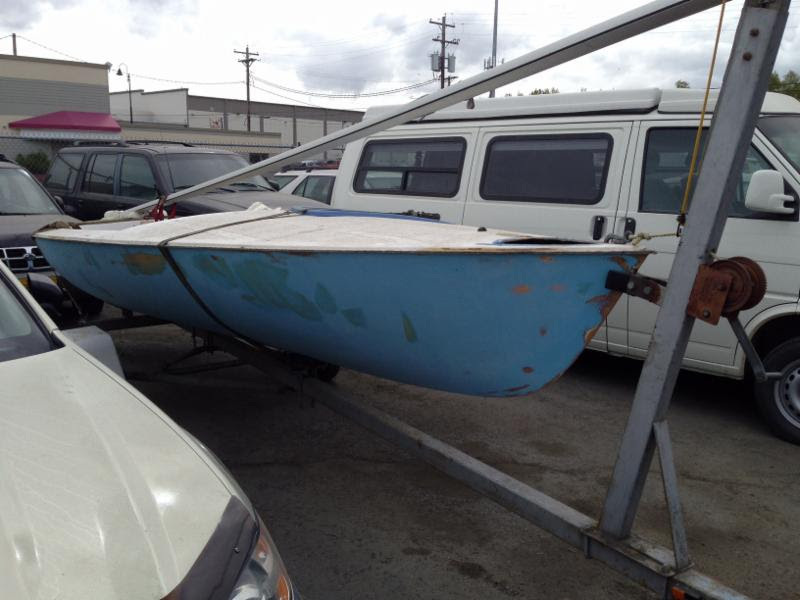 The board has approved a $1,850 budget to get this boat ready and racing this summer. The project is geared at having a fiberglass shop finish up the glass work and having this boat ready for the small boat class June 22nd. This project is funded by the club's budget but you can make an additional tax-deductible donation towards it directly. Please click on the donate button and follow the link to the GoFundMe page for this project and please feel free to share it online. The Flounder, as I discovered last summer, is aptly named because of some very obvious design flaws that lead to it often being seen floating upside down. But after spending much of last summer getting to know this boat, I have developed a plan for making this boat safer in heavy winds and more maneuverable in low winds. The board has approved a $1,340 budget for purchasing a custom designed rudder foil, a new tiller after the old one broke, and a Mama-Bob masthead float. The goal with this boat is the same as the Bucc, to have it ready and racing by June 22nd. The season starts here! We need to put boats in the water on docks on moorings. This is our yearly spring work party and potluck. If this was a monthly email would this be welcomed? I just mark everything as spam, so don't take it personal. What did you view this news letter on?